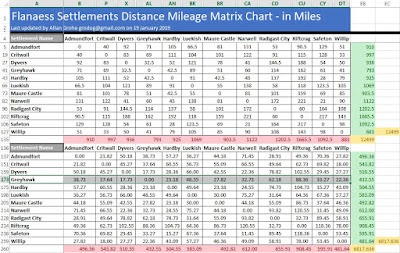 In May last year I began work on building a Settlements Distance and Mileage Chart for the Flanaess, but the project has lain fairly fallow until recently. Greyhawk fans have been creating and sharing content online for 25+ years, across many platforms. Join Bryan Blumklotz, Mike Bridges, Allan Grohe, Carlos Lising, Anna Meyer, and Kristoph Nolen as we celebrate and showcase Greyhawk resources created by the fans who champion one of D&D's oldest settings. Reference handouts will be provided, and perhaps prizes if we get our act together! Bryan “Saracenus” Blumklotz – Bryan is the lead administrator for the CanonFire! A Greyhawk Resource! Facebook group and is creator of the World of Greyhawk Heraldry site. Mike "mortellan" Bridges – Mike publishes the Greyhawk blog Greyhawkery and co-hosts the weekly Legends & Lore show on the Greyhawk channel. Allan "grodog" Grohe – Allan publishes his grodog's Greyhawk fan site and is co-founder of Black Blade Publishing (OSRIC, Rob Kuntz’s The Original Bottle City, etc.) and The Twisting Stair mega-dungeon design zine. Carlos "caslEntertainment" Lising – Carlos writes and publishes OSRIC adventures set in Oerth and in Avremier via casl Entertainment and Patreon. Anna "GH Maps" Meyer – Anna publishes her Flanaess maps and founded the Flanaess Geographical Society Facebook group. She also co-hosts the Legends & Lore Greyhawk show with Mike Bridges. Kristoph "Icarus" Nolen – Krisoph is leading the redesign of Greyhawk Online and showcases his artwork at http://wkristophnolen.daportfolio.com/. Additional informationabout the seminar (including a recording of the session and any distributed handouts) will appear on Greyhawk Online at https://www.greyhawkonline.com/seminar. Convert the raw distance between each city into a ratio relative to the hex sizes on the Darlene Folio maps: (X mm/55mm). Like in the first/ upper set of cities, I also fact-check the figures to insure that they match properly. 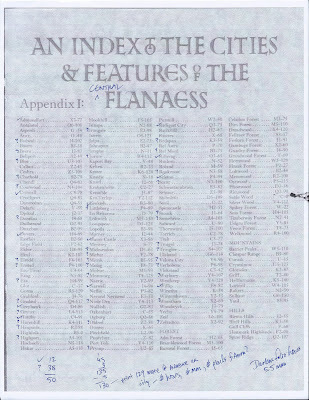 I think I’ve also found a good methodology for how to manually count out of the Darlene map mileage distances: I’ll simply print a copy of the “Index to the Cities & Features of the Flanaess” page from the Glassography and measure out the distances for each listed city, one city to a sheet. 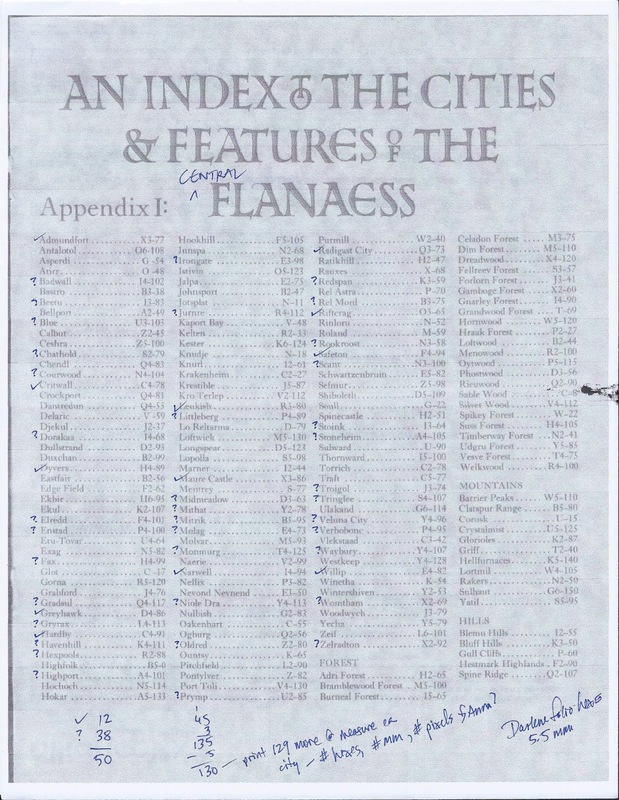 Interesting aside #1: of the 130 settlements that appear in the Glassography index, about 50 appear in the general region of the Central Flanaess. That’s 38% of the cities squeezed into an area only that occupies only 25% of the Darlene mapspace. Interesting aside #2: looking at each page of the original maps to calculate the settlement density will also be an interesting exercise to go through, I think. One of the major issues I’ll want to call out in the data is a possible discrepancy in measurement when the distances span both of the Darlene maps: maps can shift around, the hexes could be misaligned, etc., so measuring across both maps will be more challenging and more prone to error than when measuring within either map alone. 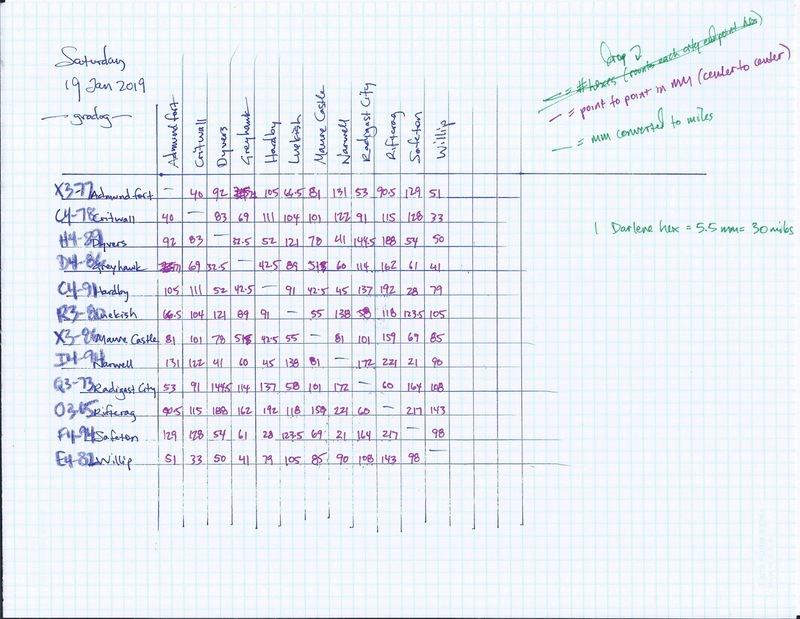 In my prototype data set, only Luekish, Radigast City, and Riftcraft appear on the right-hand map, so I calculated all of the left-hand map’s distances first, then measured the right-hand ones back to the left, and wrapped up with the right-hand-only mileage. 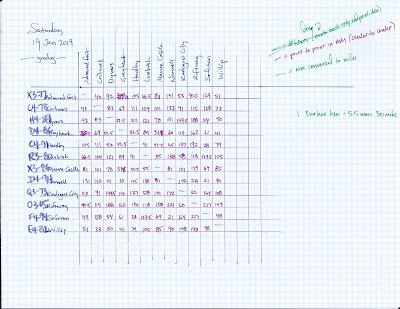 Once I have a better understanding of the scope included in the map handouts that we’ll distribute at the seminar (and we will post all of the handouts to Greyhawk Online, and at minimum an audio recording of the seminar as well), I will update the list of cities to feature any other major ones that aren’t already included in the chart, which will finalize the initial prototype data set. Count out all of the distances in the left-hand map. Count out all of the distances in the right-hand map. 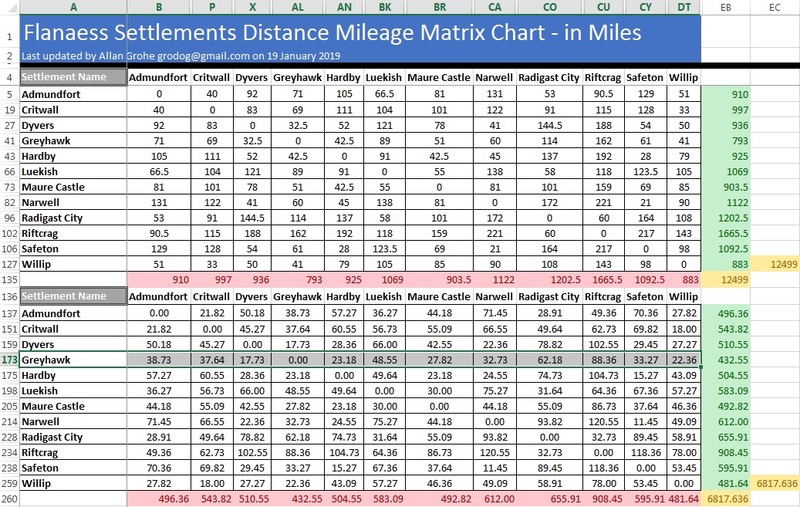 Count out all of the distances that span both maps. I’ll continue to post updates here as I make further progress! I hope the information proves useful and inspiring for your games, Anne. I think your general impression of Greyhawk sounds pretty accurate, and the setting certainly inspires crafting your own canon as well as remolding existing canon, too. If you're looking to learn more about the setting, we're in the process of revamping and updating https://www.GreyhawkOnline.com as a general-purpose fan resource site for the setting, so it's worth a look if you've not previously visited (and if you have, it's worth a look if you've not been back recently!). I would love to see an equally scaled map of the USA overlaid onto the Flanaess map(s) to help image the what the actual distances would be. I'm sure I've seen maps like that over on Canonfire! in the past, WFTA. Will see if I can dig them up. I am very excited by this project and I'm astounded no one has tried it before. I did try to make a population density map once for the Great Kingdom based on 83 stats. I chose that nation mainly because of the high pop totals and large cities made it worth my while. It was raw though and not something I'd present today. I really wish I was going this year. My budget got thrown off last Sept. But 2020, I plan to go for sure. Looking forward to seeing at NTX at least, and GaryCon in the future; hopefully we can game together too!